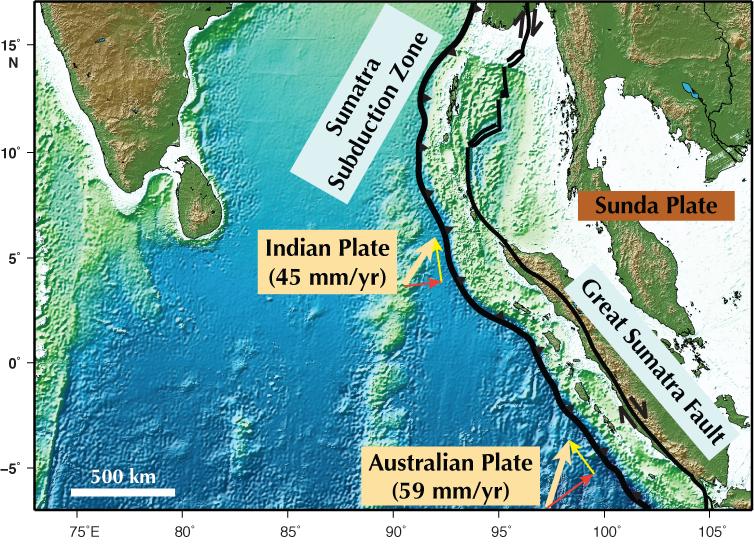 The Indian and Australian Plates plow northeast into the Sumatra subduction zone, part of the larger Sunda subduction zone, at a speed of 45 mm/yr. The angle between the direction these two plates move relative to each other is not always at a right angle (90°) to the subduction zone itself–here it is about 50°. Sliding under the Sunda Plate at an angle is not easy, so several large strike-slip fault systems help to accommodate some of this movement. If you thought learning vectors in high school was pointless—think again. This is a perfect vector component problem! 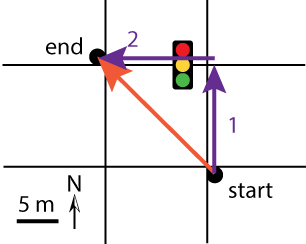 Each side of the triangle is a vector, and we can think of the two pedestrian crossings as components (purple lines/arrows) of the vector that connects your start and end points (orange line/arrow). A vector is a quantity that has a magnitude (in this case length, the distance across the intersection = 20m) and a direction (NW). Any vector can be broken down into component lengths and directions at right angles, like the two sides of the intersection that you just walked. The main subduction zone thrust fault takes up primarily the NE-directed motion of the Indian Plate, perpendicular to the subduction zone. That is, the orange red component of the plate motion vector is taken up by earthquakes on the subduction zone that allow the plates to move past each other. Here are two models that show the motion of the plates during the 2004 M 9.2 Great Sumatra-Andaman Islands Earthquake. 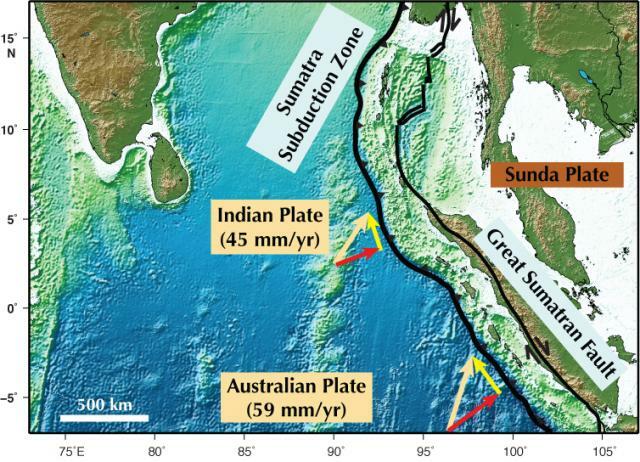 During the earthquake the plate overlying the subduction zone actually rebounded towards the SW, over the down-going Indian Plate. 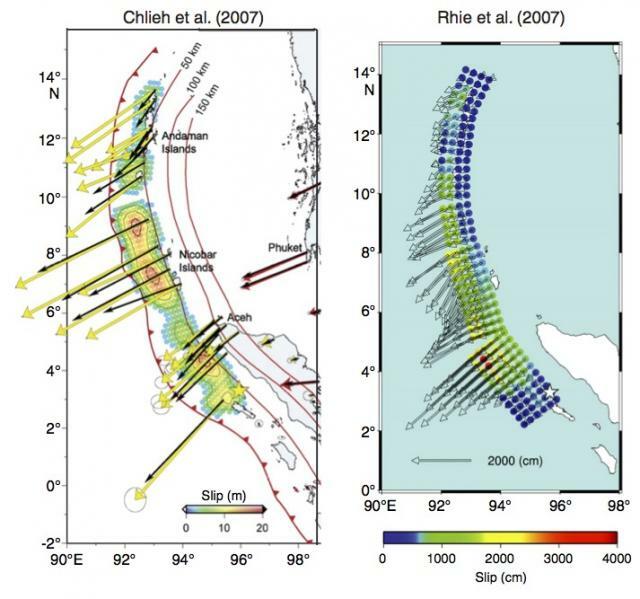 Notice that the arrows (from GPS measurements of ground motion change before and after the earthquake) point almost directly across the subduction zone at 90º (models from Chlieh et al., 2007, and Rhie et al., 2007). But there is still plate motion to account for in the system: the yellow component of the overall plate motion. Faults parallel to the subduction zone take up the slack – This is fairly common in subduction zones because plates rarely meet exactly head on. These long, subduction zone-parallel faults are strike-slip faults. They’re nearly vertical in the subsurface, and motion along them can be seen looking straight down, as if looking at a map. The San Andreas Fault is a well-known example of a strike-slip fault that lets the Pacific Plate move north along the North American Plate. In Sumatra, the primary fault taking up this motion is the Great Sumatran Fault which runs along the center of the island of Sumatra. In fact, the fault runs very close to the volcanic arc of the subduction zone. The southwestern side of the fault moves to the northwest, the same direction as the plate motion not accounted for by subduction. There are also other strike-slip faults offshore, also parallel to the subduction zone, which help to take up some of this plate motion. This figure shows different historic and recent earthquakes in the Sumatra region, including along the Great Sumatran Fault, parallel to the Sunda Trench (Fig. 10 in McCaffrey, 2009). This type of plate boundary geometry is not unique to the Sumatra region. In many plate boundaries where plates converge at an angle rather moving straight toward each other, we see that long strike-slip fault systems help to take up the overall plate motion. The Liquine-Ofqui Fault and Atacama Fault serve a similar purpose in the Andean subduction zone in Chile. The Median Tectonic Line is the largest strike-slip fault in Japan and accounts for the oblique motion at the Nankai subduction zone. Learning about processes at one site on Earth can help us understand what’s going on elsewhere in the world! Baroux et al., 1998. Slip-partitioning and fore-arc deformation at the Sunda Trench, Indonesia. Terra Nova, 10 (3), 139-144. Bellier and Sébrier, 1995. 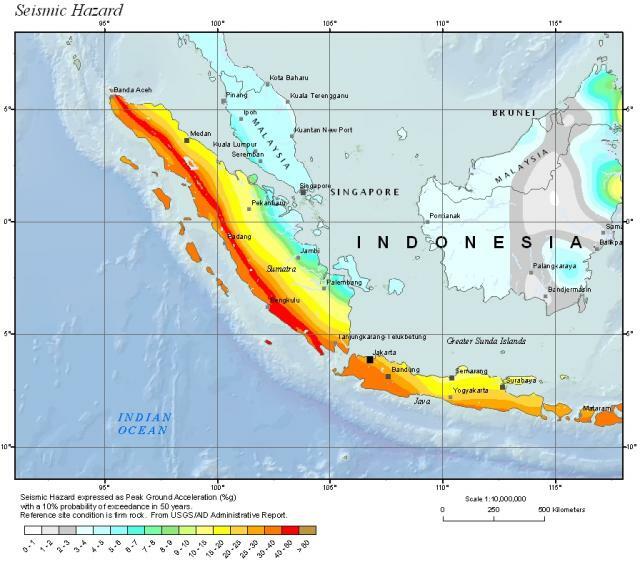 Is the slip rate variation on the Great Sumatran Fault accommodated by fore-arc stretching? Geophysical Research Letters, 22 (15), 1969-1972. Berglar et al., 2010. Structural evolution and strike-slip tectonics off north-western Sumatra. Tectonophysics 480, 119-132. McCaffrey, R., 2009. The Tectonic Framework of the Sumatran Subduction Zone, Annual Reviews in Earth and Planetary Sciences, 37, 345-366.